"White men are stronger than black men. Why? Because they have a better god!" In his first film, director and co-writer Jean-Jacques Annaud aims his satirical eye at a multitude of targets: first and foremost colonialism, with its implied nationalism and racism, but also class relations, the Catholic church, and militarism. His colonial occupiers lead the good life, rarely having to put in much of an effort (why bother, when the natives will do everything for you? ), and more preoccupied with duplicating the lavish feasts of their homeland than helping the people they are exploiting. The natives, on the other hand, have little use for their new rulers, and bemusedly put up with their laziness and sometimes ridiculous behavior. Class and class relations also get a skewering, albeit a gentler one. Rechampot (Jean Dufilho), the local shopkeeper, has only one concern�getting and keeping his money. Shopkeepers as a class have never been held in very high esteem in France (indeed, it was Napoleon who derided an entire country, Britain, as nothing more than "a nation of shopkeepers") and certainly Rechampot fulfills that lower-class stereotype. But it is in the person of Hubert Fresnoy (Jacques Spiesser), the sole upper-class inhabitant of Fort Coulais, who is educated and "refined" (in the words of the others), that class relations are most thoroughly examined. After the first battle, the others seem to accept his leadership as given and natural, even shunting aside the local military representative in favor of Fresnoy's command. So extreme is their seemingly unconscious toadying that, when Fresnoy introduces his native concubine at a picnic, the French ladies instinctively shake her hand and bow to her, which would be unthinkable under any other circumstances. However, it is the the Catholic Church that is singled out for the most scathing satire. Early on, Father John (Peter Berling) and his cohort are seen haggling with the natives who trade their artwork for cheap religious knickknacks. But they later burn most of the items, since "you can't even give this stuff away to charity." The churchmen are portrayed as devious, hypocritical, and lazy, and in one of the funniest scenes of the film, they prove to the natives that the white man's god is better than theirs, because white men (and natives who believe in the white man's god) can ride bicycles, but the heathens can't! While the main concern of the film is satirical, Annaud balances these mostly script-driven elements with a careful, if rather functional, visual style. Especially in the early parts of the film, there are beautiful shots of the natives going about their daily activities, and of their village and dwellings, and some of the battle scenes are carefully composed and fairly striking. Annaud also uses cutaways effectively, often to show a native reacting bemusedly to some silly bit of behavior on the part of the French. On the whole, however, the style is mostly functional, Annaud preferring to use his script to make his points. Image Transfer Review: Despite the packaging's claim of a 1.66:1 transfer, the aspect ratio is in fact closer to 1.78:1, although this will go unnoticed by most viewers due to overscan. This is a curiously inconsistent transfer. Many shots and sequences are clear, colorful, and detailed, allowing the beauty of the settings to shine. But in just as many others, there are problems: softness, seeming overexposure, orange/reddish fleshtones, lack of color gradation, and occasionally grain. However, given the age of the film, some of these faults may be due to the print used, rather than the transfer, and in any case they are not enough to detract from one's enjoyment. Audio Transfer Review: The mono sound is always clear, if a bit limited in fidelity, which shows up mostly in the musical score. Extras Review: The interviews with Annaud and Arthur Cohn are interesting, and provide perspective on a feature that was a total failure in its country of origin (a total of 900 spectators on its first day in France), but went on to win the Oscar® for Best Foreign Film. The separate interview in Producer's Perspective is a short conversation with producer Cohn, who is a fascinating raconteur and full of love for cinema. It's followed by several text screens containing a speech given while presenting his honorary Doctorate of Arts from Boston University. But the real bonus here is the complete documentary feature, The Sky Above, The Mud Below, Arthur Cohn's first experience as a producer, which also won an Academy Award, in this case in 1962 for Best Documentary Feature. It's the story of a French expedition through (then) Dutch New Guinea, covering areas that were at that point unexplored and even unmapped. From the standpoint of a viewer in 2003, it's hard to know what to make of this film. Is it a serious examination of New Guinean tribes and their culture, a product of the French intelligentia's fascination with ethnography that flourished in the late fifties? Is it an examination of the intellectual and physical stamina required to travel overland through the jungle, and all of the hardships there implied? Or is it just an exploitative, voyeuristic depiction of the bizarre (to Western eyes) customs and rituals of unknown tribes and peoples? Certainly the first third of the film, with its bloodletting ceremonies, rites of passage, and strange birthing rituals, lead one to expect nothing more than an entry in the series of revolting "Mondo" films that would flourish in the 1960s, but the film soon changes course to focus more on the explorers' hardships in crossing unknown and hostile territory. Or is it? Much to-do is made of the fact that they are crossing areas that are blank on their maps, yet the relative ease with which planes are able to fly into those areas to provide the numerous drops of food and supplies that they require, suggests that perhaps these areas are not so much unexplored as simply undocumented. The narration is equally problematic, alternating between condescension (a shot of a rickety bridge, built by the natives, is accompanied by the voice-over "a masterpiece, for this part of the world"), and some half-hearted attempts at understanding ("in spite of their barbaric customs, they are no longer savages in our eyes"). Perhaps it's just best to turn off one's overly PC-sensitized judgment, and to enjoy this film for what it is�a fascinating documentary, na�ve in its conception and execution, but containing many fascinating scenes. How could one not enjoy the sequence where the male natives, replete with their foot-long yellow codpieces, crowd around the explorer's radio to listen with fascination to a song by Edith Piaf? 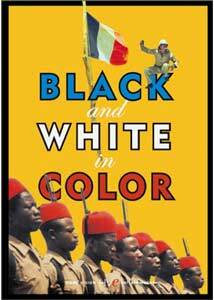 Jean-Jacque Annaud's first film is an amusing and effective satire of colonialism, racism, class relations, and the Catholic Church in colonial Africa. Taken with the added feature-length 1961 documentary, The Sky Above, The Mud Below, the story of an expedition through (then) Dutch New Guinea, this DVD is a fascinating examination of Africa seen through French eyes.